This is probably a bad day to start this. It is April Fools Day after all, but I'm excited to introduce a new venture--podcasting. This is no joke. I have really ventured into new territory. If you listen to the podcast introduction, you'll understand how I got into this. It is fun but it's a whole new learning curve. 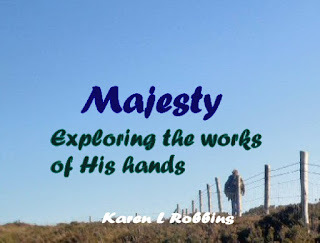 Each Monday I hope to have a new episode of Majesty, Exploring the Works of His Hands. Each one will be an inspirational journey to one of the places we've visited. Won't you come along?